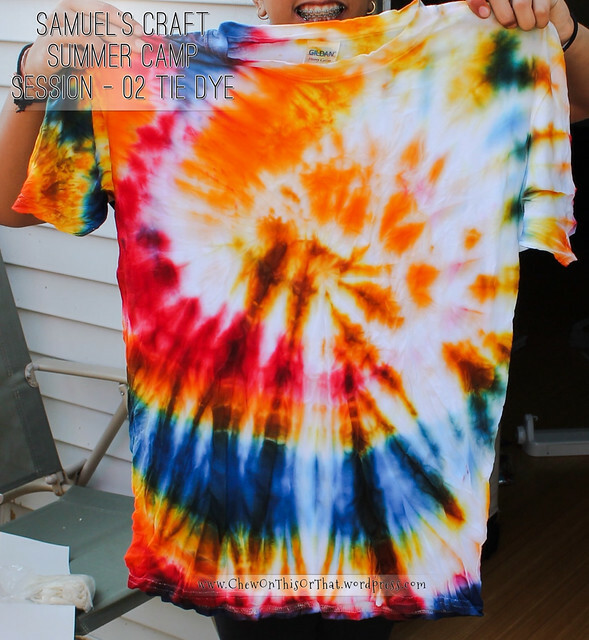 Session 2 – wearable art, in other words, TIE DYE! 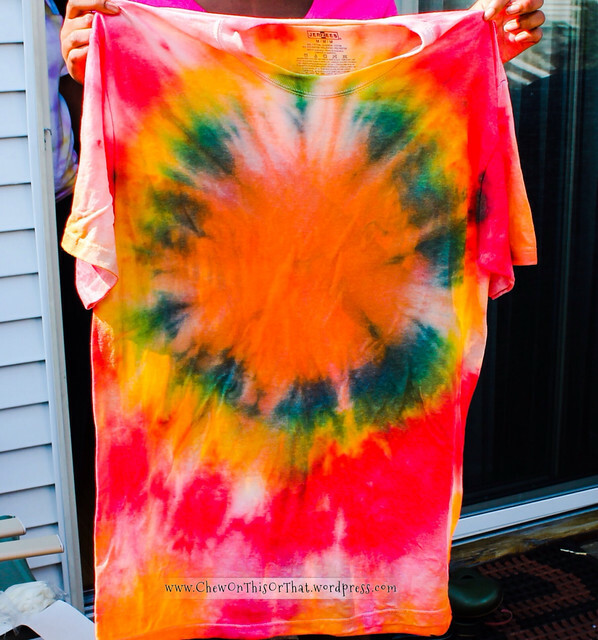 Nothing says summer quite like tie dying tee shirt. The campers got wet, messy and everyone had tons of fun, all in the name of art. Here are some sample tees. 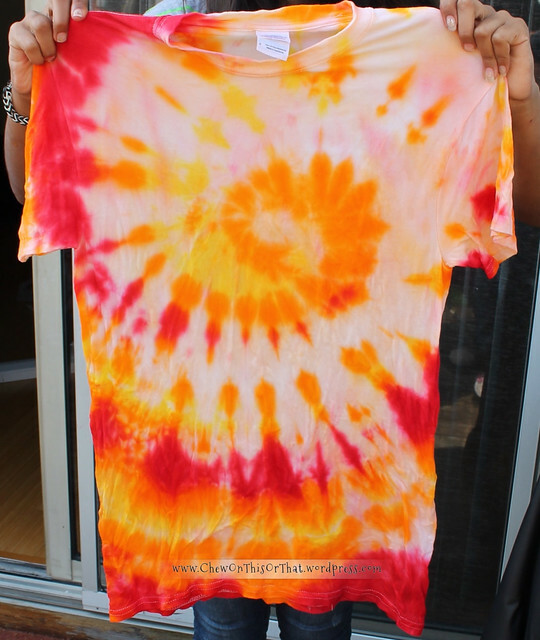 To make this shirt, the camper rolled the shirt in a spiral, secured it with rubber bands, and used the colors red and yellow dyes. The colors blended together to make orange. For this shirt, the camper chose a bullseye pattern and used all available dyes. Remove shirt from water and ring out excess water. Tightly coil shirt according to pattern choice and secure with rubber bands. Use freshly made dye – the dye will loss it’s affectiveness after 45 miniatures or an hour. For bright colors use less dye, for pastel colors use more water. When applying dye to the shirt, start at one section then move to the next. For best intensity, make sure to completely saturate the teeshirt. Don’t worry there will still be white spots if you saturate it. When you finish, place each shirt in its own ziplock bag, for 45 minutes to an hour. This will allow the dyes set in and not fade as fast. Rinse each shirt with clean water. If water is not clear, the color in the bucket will dye the undyed “white” parts. 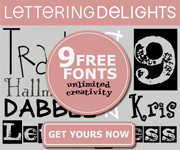 I must say I completely enjoy my new Silhouette Cameo Electronic Cutter. I practically use it daily for all my crafting and/or the kids homework needs. Recently, I decided to venture into personalized tee shirts and onesies. 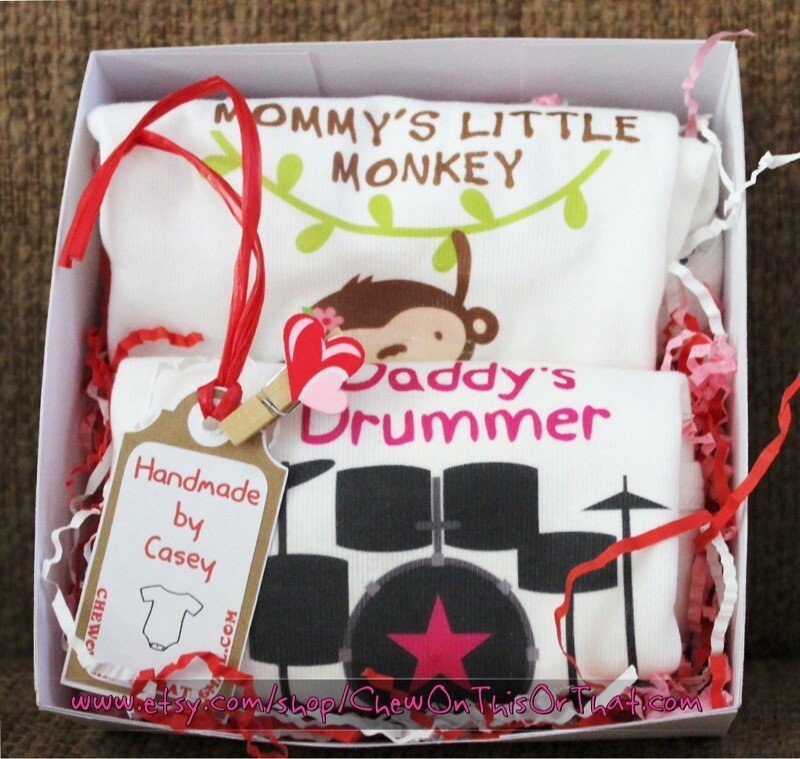 The first set of personalized onesies were a cute set for the preschool teacher. An apple for the teacher with the teacher’s name and a cute little teddy bear in a pink flowered dress. The second onesie order had a theme for the parents. For the mom inspired onesie, “Mommy’s little monkey” with a cute girlish monkey swinging from a vine. Also, the child’s name placed towards the bottom of the graphic close to the leg of the monkey. Dad’s onesie, “Daddy’s little drummer” in a pink font and the child’s name is on the bass drum under the pink star. For this set, I decided to make the box and packaged it witty red, pink and white grass (can’t think of the correct term for it). I must remember to start taking pictures of my craft. Lately I am so excited to get the items to the customer, I completely forget to take the picture.